Richard Hill, with his wife, and several of their children, was living in Madeira in 1759 to which he had relocated when his businesses in the colonies failed. Lifelong Quakers, the family, though scattered, kept in close touch with kin in England and America. Although Quakers were technically committed to the spiritual equality of men and women, practically, men/husbands exercised control in political and economic matters. Richard Hill’s advice in the letter that follows (an exception to “the words of women”) to his newly married daughter RACHEL HILL WELLS (1735-1796) is certainly loving and well intentioned but it puts the burden of keeping the relationship on a sound footing on the wife who is advised in general to defer to her husband and make her influence felt through indirect means. I received thy very acceptable letter of December 11th . . . and am glad to find things I sent thee and thy sisters came seasonably and pleased. But I am more especially pleased that all objections to the consummation of thy affair with R. W. are obviated, as I cannot but think favourably of his principles and professions, and consequently hope there is a prospect of thy being happy with him. But how firm soever his affection may be, it will be always necessary to cherish and keep it from sinking by a decent and becoming tenderness of him, and by a discreet conduct in all thy actions. Indeed there is no qualification of more use to carry us well through the world than prudence. And one of the greatest effects of prudence is the good government of our passions. Whoever expects to be happy otherwise than in proportion as they can govern their passions will be disappointed. In this troublesome life we must meet with many trials, and the way to support ourselves under them is to receive them with resignation and to moderate our desires, which they prevent us from gratifying. In a married state new difficulties will frequently occur, and the parties will often have occasion to make concessions to each other, and generally the party that is the readiest to make them, is the gainer by finding the other more condescending after it. It is of more consequence than people generally imagine, to be careful against disputing about small matters, for great things have small beginnings; and obstinately persisting in an opinion, about a trifle may end in a quarrel, which may lay a foundation for succeeding ones, and at last disputing on every occasion may become familiar; it is therefore of great importance carefully to avoid a first jar or quarrel, which lays a foundations for a second, &c.
A woman who must rise or fall by the good or ill conduct of her husband, has a right to give her opinion in what concerns them both, but it’s best policy in her to gain an influence over him by kindness, mildness, and condescension, and then it will be lasting. . . .
Richard HillI desire thy acceptance of a box of citron. John Jay Smith, ed., Letters of Doctor Richard Hill and His Children 1798-1881 (Philadelphia: 1854), 167-68. 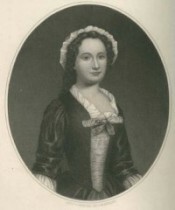 The illustration of Rachel Hill Wells is from the Digital Collection of the Library Company of Philadelphia.